In fibre optic communication, the industry has long decided the SFP+ (Small Form-factor Pluggable) at 10Gbps while the 40GBASE QSFP+ (quad small-form-factor pluggable) has become the 40Gbps form factor of choice. With 100Gbps still in its infancy, transceiver vendors are pursuing several client-side interfaces. Much work will be needed to reduce the size, power consumption and cost of 100Gbps interfaces before the industry settles on a single pluggable form factor for the single mode and multimode standards. This article will introduce CFP module. CFP module (C form-factor pluggable) is a Multi-Source Agreement (MSA) that defines a hot-pluggable optical transceiver form factor to enable 40 Gb/s and 100 Gb/s applications, including next-generation High Speed Ethernet (40 GbE and 100 GbE). Pluggable CFP transceivers will support the ultrahigh bandwidth requirements of data communications and telecommunication networks that form the backbone of the Internet. The CFP transceiver features twelve transmit and twelve receive 10Gb/s lanes to support one 100GbE port, or up to three 40GbE ports. Its larger size is suitable for the needs of single-mode optics and can easily serve multimode optics or copper as well. The QSFP+ Module is similar in size to the CXP and provides four transmit and four receive lanes to support 40GbE applications for multimode fibre and copper today and may serve single-mode in the future. Another future role for the QSFP may be to serve 100GE when lane rates increase to 25Gb/s. With the completion of 40/100 Gigabit Ethernet (GbE) optical interface standards (IEEE 802.3ba-2010) and pluggable optical transceiver module specifications, and with the production shipment of first-generation 40GbE/100GbE CFP products underway, optical module vendors are focusing on developing technologies and proving design-ins for their next-generation 40/100GbE pluggable optical transceivers. The key objectives of next-gerneration of CFP modules include significant reductions in module power dissipation and size, which are critical to increasing system port density and reducing overall optical port cost for system vendors and their customers. Critical technologies for tackling these design targets include 4x10G and 4x28G hybrid integrated TOSAs/ROSAs and process improvements in 28G gearbox and CDR ICs. 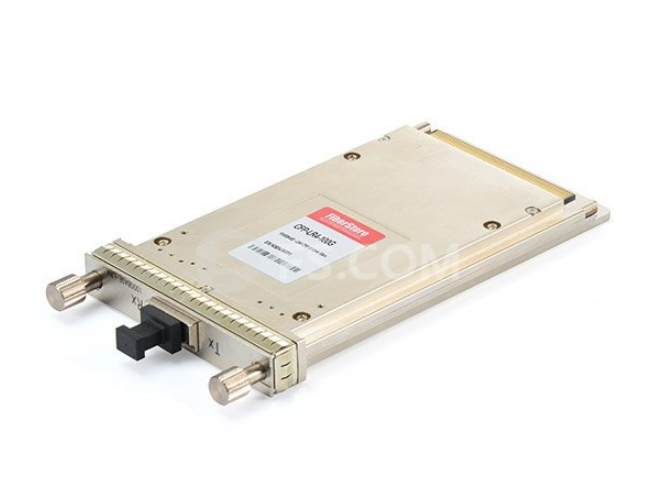 There also may be consideration of uncooled CWDM 28G laser technology for realizing 100GbE optical transceivers in a QSFP+ like form factor for short singlemode fibre. FS.COM developed the 40GbE CFP module for 10km transmission by using a high-speed four-wavelength CWDM laser diode, through the application of its own low-power-consumption drive technology and high-density mounting technology. Moreover, you can find other 10G, 40G fibre optic transceivers at this website. This entry was posted in CFP Transceiver and tagged CFP Transceiver, optical transceivers, QSFP+ Module on July 23, 2013 by Admin.